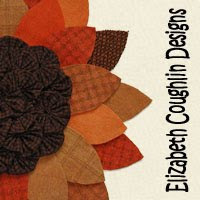 Elizabeth Coughlin Designs: Halloween Haunts Blog Hop! A huge thanks to Marian of Seams To Be Sew for organizing this hop! Halloween is such a fun holiday to create for; I appreciate her giving us all a chance to do just that! 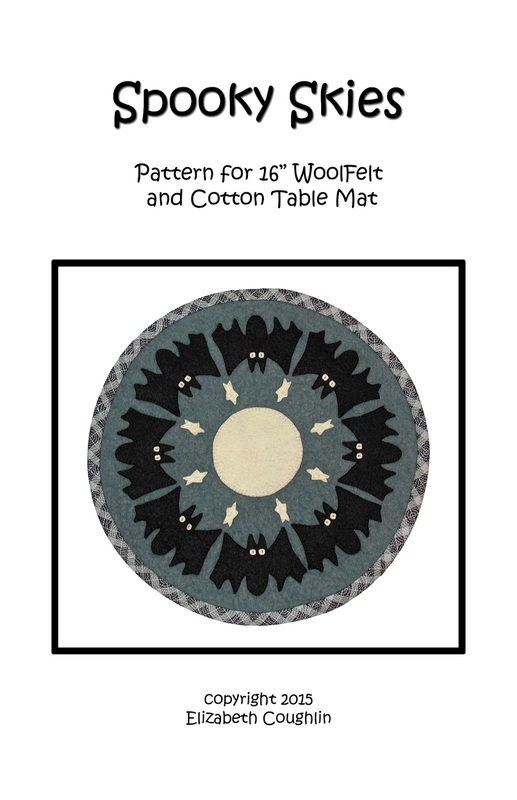 First, I want to share a pattern from my 16" Round Table Mat Series (the .pdf pattern is available for purchase). It's called "Spooky Skies" and is the perfect accent for your Halloween table! 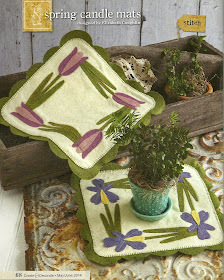 The table mat is made in WoolFelt and cotton fabric. either my Craftsy or Etsy shops. Next, I made two very quick projects for this hop, with the hope you will make them yourselves for your home. 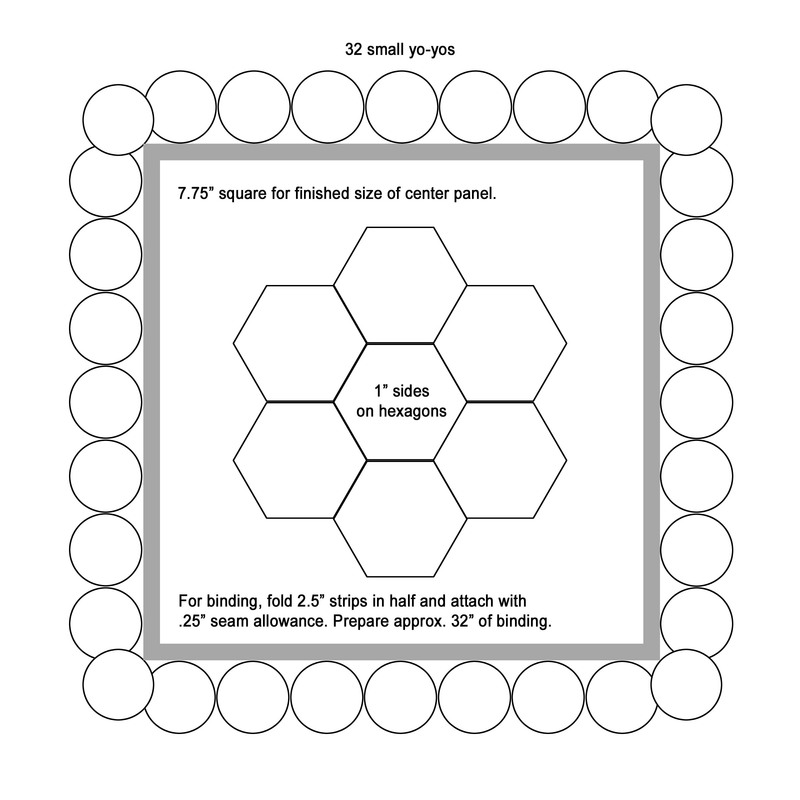 Cut a 16" circle from your choice of fabric. Sew a loose running stitch in floss or strong thread about 1/4" in from the edge of the circle. If you are using one-sided fabric, sew on the wrong side. 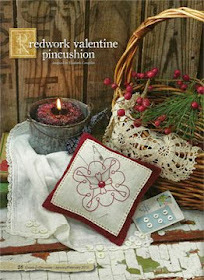 I used homespun, which is the same on both sides. Place the filled bag in the center of your fabric circle. Stick a stick in the center, pushing it into your stuffed bag. Pull the gathering threads and tie off around the stick. (You're basically making a large yo-yo). 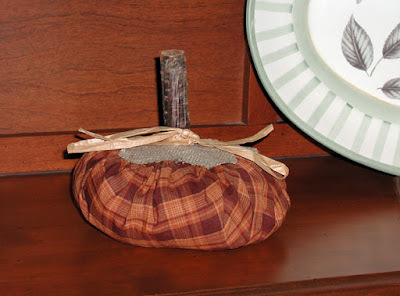 Cut a "collar" from burlap, WoolFelt, or other fabric (I used burlap cut in a flower shape). Cut an "X" in the center. Slide the collar over the stick, and glue down onto your formed pumpkin. I used all-purpose white glue. Glue a piece of raffia or twine around the base of the stick, where it meets the collar. Tie the raffia into a bow. A there you go...a squishy, bumpy, fabric pumpkin! You can hang it on your pumpkin to make it more Halloween-y, or hang it on a cabinet, doorknob or elsewhere in your house. The FREE instructions to make the ornament can be downloaded HERE. I promise, it's very easy to make! And, you could make it using black + any WoolFelt color you have on hand. 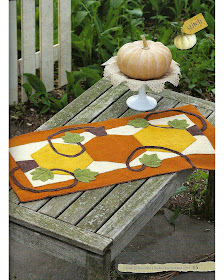 I hope you have fun making either or both of these projects, and/or the Spooky Skies Table Mat! I will respond to all comments, unless you are a No Reply Blogger who doesn't post an email address. Be sure to visit all the other creative people on today's list, and for the rest of the hop! Great projects, bats are always cute/spooky. Love both projects! I've actually made a stuffed pumpkin before. Everyone wanted one after seeing it. Thanks for the tutorial!! 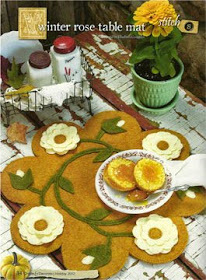 I love your Round Table Mat it is elegant and looks very fun to make. 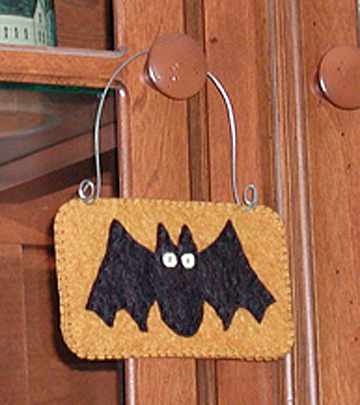 Your stuffed pumpkin and little bat hanger are great, too. Very neat things to liven up the holiday. Lovely table centre, I hope to try the bat hanger. 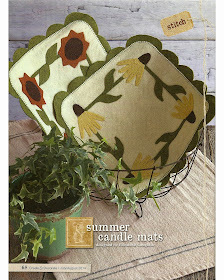 Love your table mat! The bats are adorable! Very cute those bats in a round! Love it! And thanks so much for the sweet pumpking and bat hanger! Cute projects! 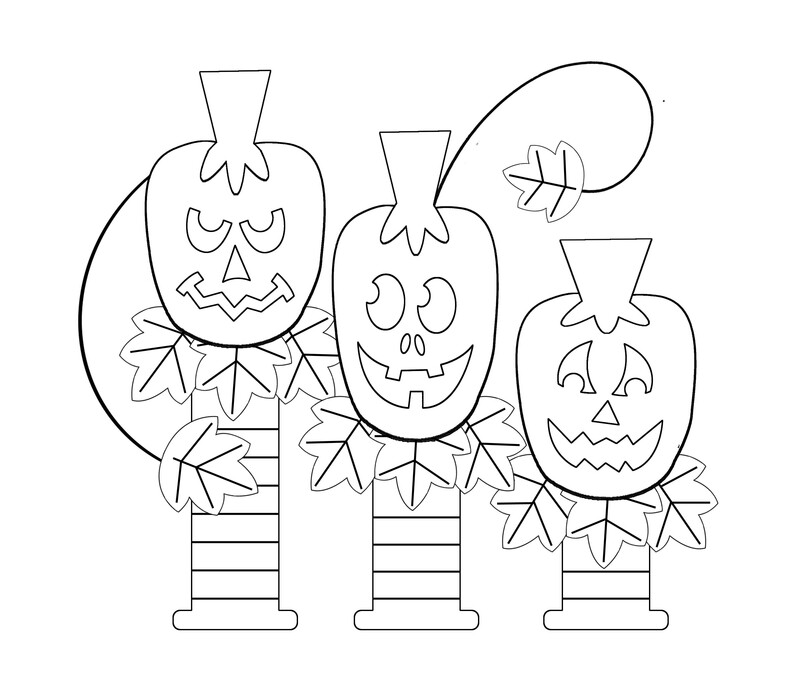 It would be fun to make a group of pumpkins to decorate a table from Halloween right through Thanksgiving. Lovely projects! I really like the round mat, very clever! Thanks for sharing!! I love your table mat ! Very cute. I would leave him outside on the doorknob to scare people on holloween. Very nice! I like the bat ornament. Those are some great projects! Thanks for the instructions for them. wonderful collection of bats. love both your mat and your mini hanging. 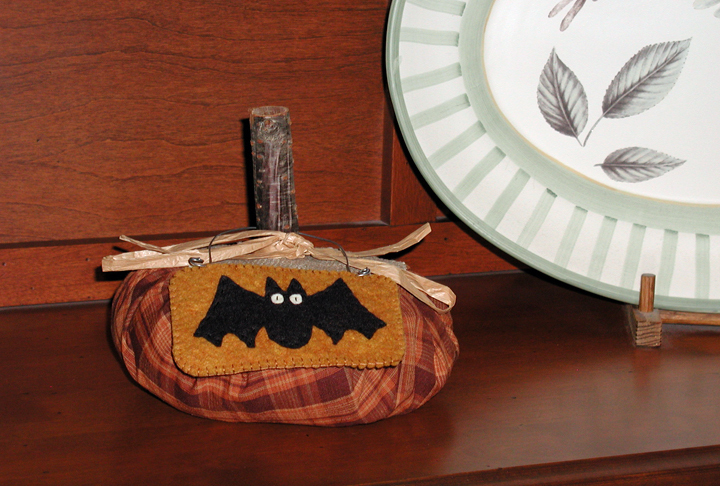 cute pumpkin too, thanks for the generous gift of the sweet little bat pattern. 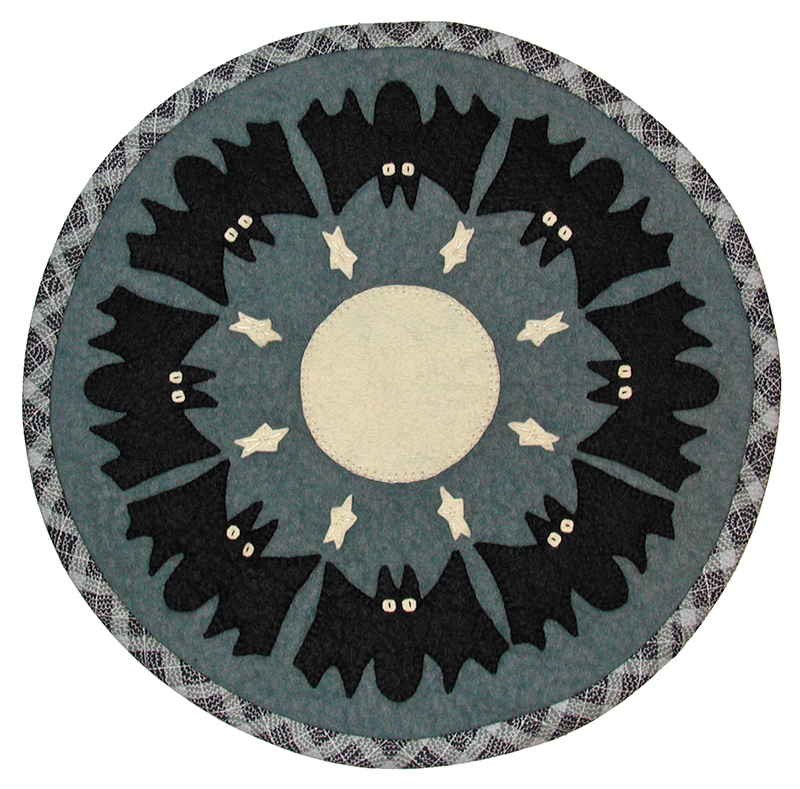 I love bats and quilting, so your adorable round mat would be perfect for me! Thanks so much for sharing your bat ornament pattern with us! Pumpkin and bat are so sweet thanks for the tut. I'm so going to do the pumpkin. I will link back to you. love your bats!! Nice pattern. Oh my gosh! What a cute little bat! Thank you for sharing these patterns. So cute! The bats are just fabulous! I love your round mat with them all lined up. Cute projects! Thank you for sharing the pattern. Your mat is amazing with all those bats circling around...love it! 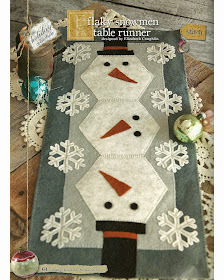 Love the table mat! Thanks for sharing your other projects too. Thanks for sharing your projects. I love the Spooky Skies mat and the ornament! I made pumpkins similar to yours last year but I could make my pumpkin patch bigger. i just added the bat hanger to my to-do list. thanks for the pattern. Love the projects and downloaded the bat hanger pattern. I think I may make the table mat for my niece for next year as she's a huge Halloween fan. Love your creations. Trying wool felt is on my "try something new" list and this little bat may be just the inspiration I need. Thanks for sharing. I Love Your Spooky Skies Bat Wool Project. Thanks for the Free Pattern! I like your bat projects the most. Very nice job there! I love the pattern! and your project is just as cute as can be! What great ideas you got there. I like your patterns, you have me inspiration to make one of those. I love the cute little bats! I love your Spooky Skies table mat! Thank you for the free batty ornament pattern! I love your projects - especially Spooky Skies. Thanks! Very cute designs. I can't wait to try my hand at your little bat. I love bats. I have a very old lamp with a shade that has imbedded glass in the shape of bats all around it, and I absolutely love it. Wish I knew more about it, but have never been able to find anything out. 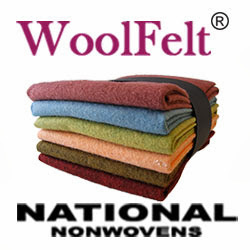 And wool -- mimics the fuzzy feeling of that soft batty skin! 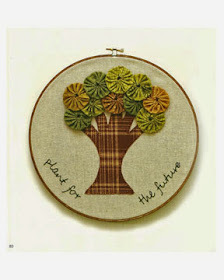 Very cute projects. Thanks for sharing! I love the table topper! I thought it was a lovely all-year-round pattern when I first saw it, and then I saw the delightful bats! What fun! Cute projects. I'm going to make your pumpkin. Thanks. I love your bat table mat. So nicely done! The bat mat is very cool, I can easily see that on my kitchen table, but the pumpkin and bat ornament are also very cool. I love quick and easy projects that can usually be done in less than a day.. What a great job these projects are and thank you for the pattern. I love the Spooky Skies pattern! Thanks for sharing the two little projects. Thank you for sharing the ornament instructions. That will be fun to make with my nieces and nephews. 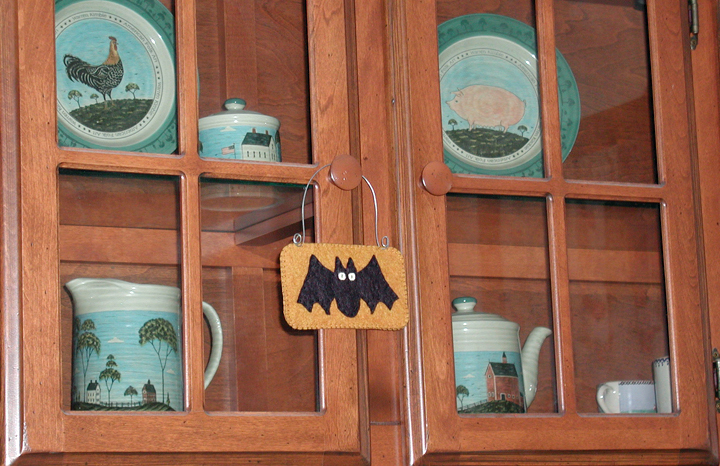 Thanks for the bat ornament--sew cute! 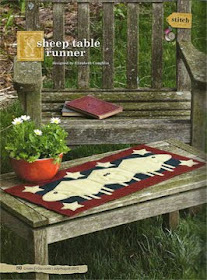 Love the wool table mat. Love the bat ornament - thank you for sharing today. love the spooky skies pattern. So darn cute. So is the pumpkin and the bat ornament. Thanks for sharing! I left my comment in the wrong place...ooops! I do love your bat ornament and will be making one for sure! I know I can get that done rather than a full quilt like I had hoped by Halloween! Very cute projects. Love the bats! 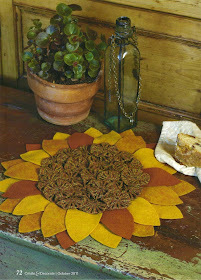 I love the circular table mat! Your projects are very sweet!! I like your bats, so very cute!! Very cute projects. Thanks for the bat ornament instructions. Your designs are wonderful and thanks for the little bat! Always nice to go hopping! So glad to see you here! Love all the little details that make this so cute! The table mat is sooooo cute! I love your table mat! I haven't seen many in round and it's a great change! Very nice projects. Love the bag and the bat! Great projects! Your circular bat mat is spooktacular! Thanks for the tutorials. cute projects, thanks for sharing! 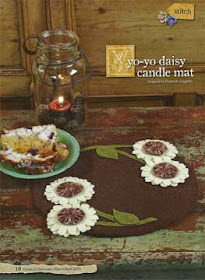 Cute projects, love that candle mat. These projects are great. Thanks for the pattern. Textile Folk Artist. 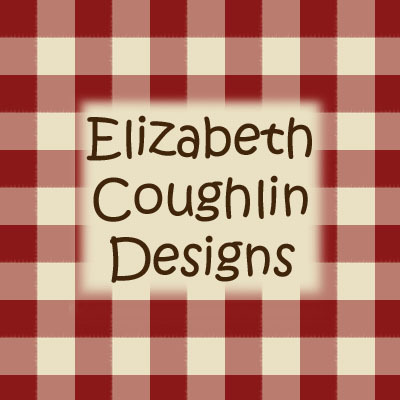 All my designs are copyrighted and the property of the designer...me! 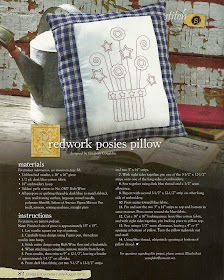 You may use them for personal use only, and may not resell the patterns or the finished products you make with them. 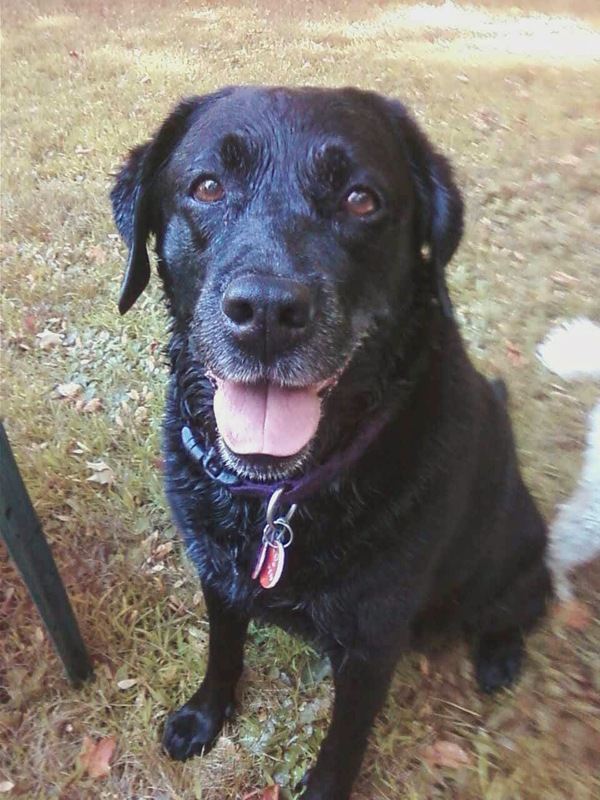 All photos on this blog are the property of Elizabeth Coughlin.